Since its release, the original Supreaux project became quite popular as a low to medium gain overdrive, so we decided to work on a refined update while retaining its characteristic tone and honoring its origins. We are very proud and satisfied with the sonic improvement of this second version, which we obviously named Supreaux Deux. The three gain stages now follow closely the topology of the Revisited Fetzer Valve. An 18V supply was chosen in order to have more gain, additional headroom and higher output capability. As a side effect, there was an improvement in the overall character of this circuit due to the higher supply voltage that can't be easily described in words; a je ne sais qoi if you please. The miller capacitance of the first stage is now included for a more accurate frequency response, which translates in a mellower but still harmonic-rich sound. The output impedance of each valve stage was considered and included for a more accurate tone shaping. This improved the response of the Tone control making it much more effective, so we departed from the 5n tone capacitor used in the amp and chose a value of 1n5 instead. You may want to experiment increasing this value if you prefer darker sounds. 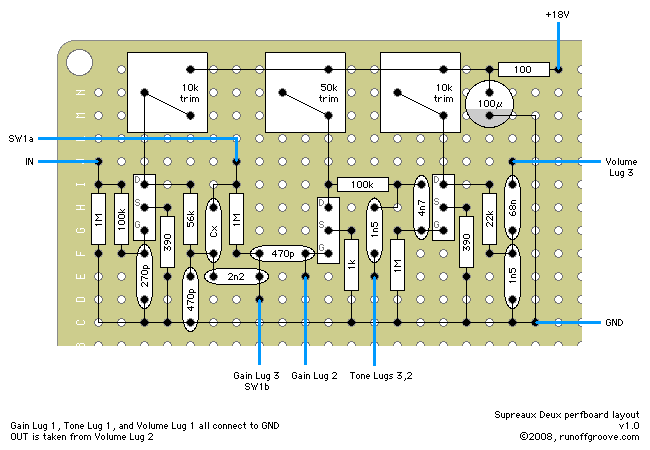 The network around the Gain pot and the output filter were simplified and optimized for less overall insertion loss. As an option for the builder, an extra capacitor may be added with a switch in order to fatten up the sound, which is especially nice when using the pedal as a full frequency boost. The Supreaux Deux differs from other FET-based designs based on tube amps, since we had the benefit of owning the actual amp to compare with the stompbox version. The revisited circuit captures much of the amp's tone. The brilliant treble response is replicated, along with the Tone control range. A sweet overdrive even kicks in at nearly the same point in the Volume pot's rotation! If you are looking for an articulate blues or classic rock sound, this is a good place to start. Many sounds, from Albert King-type tones to a Led Zeppelin sonic blitzkrieg to sparkling clean can be produced with the Supreaux Deux. Be sure to work your guitar's volume knob and your pick attack when playing with this circuit, as it is very sensitive and dynamic. Regarding the supply voltage, voltages lower than 18V will reduce drastically the overall gain and sacrifice the tone of the circuit, so 9V won't work properly, and 15V would be the minimum recommended voltage, accepting that you'll be sacrificing around 6 dB of gain. Perhaps the simplest supply alternative consists in a pair of 9V batteries connected in series. A voltage doubler built around a MAX1044 or equivalent will also work fine, provided the clock frequency is above the audio range. Supreaux Deux by runoffgroove.com is licensed under a Creative Commons Attribution-NonCommercial-ShareAlike 3.0 Unported License.